Qualcomm has a history of showing others how virtual reality should be done, and today the silicon giant is back at it with a new VR development kit (VRDK) that flexes the impressive power of its forthcoming Snapdragon 835 chipset. Before you get too excited, know the Snapdragon 835 VRDK isn't a consumer product. It's destined for developers in anticipation of devices that house the next-gen chip, which, by the way, is designed to unleash more intensive VR experiences with improved power efficiency. Of course, there's consumer benefit in this because, as Qualcomm's Cristiano Amon describes, the newest VRDK is about helping to "accelerate a new generation of VR games, 360-degree VR videos and a variety of interactive education, enterprise, healthcare and entertainment applications." On the hardware front, the Snapdragon 835 headset is free from wires, has a 2560 x 1400 display, 4GB of RAM and cameras that enable six degrees of freedom motion tracking. It also features spatial audio and eye tracking for a more immersive experience. 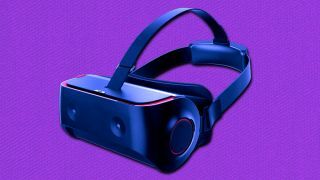 "This isn’t the same old poor 'smartphone VR' experience from a year ago, it really is a watershed moment for mobile VR, and it’s only about to get better," Hiren Bhinde, senior product manager, Qualcomm Technologies, Inc., tells TechRadar. Qualcomm anticipates releasing the headset in Q2, and we're waiting to learn more about pricing from the company. The first Snapdragon 835 devices are expected to start rolling out in second half of the year, though at least one version of the Samsung Galaxy S8 will likely sport the silicon when the phone launches on April 21. In addition to the dev kit, Qualcomm also announced an accelerator program for head mounted displays, providing reference designs and other guidelines to help hardware manufacturers bring VR devices to market more quickly. What's more, Qualcomm and Leap Motion are teaming up to combine the latter's hand tracking capabilities with the positional tracking prowess of Snapdragon 835 headsets. While Qualcomm isn't making a headset to sell on its own, the chip chief is certainly doing everything it can to facilitate even more VR innovation. Update: Qualcomm provided TechRadar with renders of the Snapdragon 835 VRDK, and this story has been updated with those images.